Being ATGATT people ourselves, there was no way we could let the dogs ride unrestrained in a moving motorcycle. I know from my old days working with a personal injury attorney what can happen when an unrestrained dog turns into a projectile in an accident. Doing it in an open-air vehicle seems like even more of a recipe for disaster. So. For peace of mind, if nothing else, we wanted to come up with a good restraint system for the dogs when they ride in the sidecar. It started with a harness. We looked at a lot of harnesses and ultimately decided on the DT Harness from Dean & Tyler Dog Products. Kay was ultimately pickier than I am about the harness choice. I kinda wanted a three-point harness where the strap in front of the chest attaches to the strap that goes under the stomach, but Kay was concerned about the added heat on warm days, so I pondered the tradeoffs. What ultimately won me to this harness, too, is the D-rings in three positions – one on each of the sides, and one on the back of the harness. It’s very difficult to find a harness with all of these sewn in. The strap is wide enough that I don’t think it would hurt the dogs if they were yanked against the harness, but not so wide that I think it’ll add too much bulk for hot days. It’s lightweight and weatherproof, and the grab handle has turned out to be surprisingly useful. We had pretty much decided that we wanted to attach leashes to the Ural somehow and leash the dogs in their harnesses into the sidecar. This would keep them from charging out if they saw something they wanted to go after – i.e. a squirrel or another dog – but let them move around in the tub. It needed to mount securely. I’d read on Soviet Steeds that some other dog owners had mounted some attachment points in the trunk and ran leashes under the seat back, so I looked into the trunk – and Lo! and Behold! There was a perfect spot that almost seemed made for mounting some dog leash attachment points. The next step was going to Home Depot and looking for some good hardware to do this. 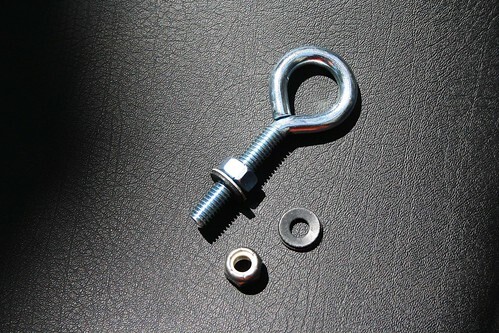 We ended up buying some eye bolts, some washers that are rubberized on one side and metal on the other side, and a nylock nut for the bottom. We bought it in 1/4″ size and 5/16″ size – I thought the 5/16″ was just about perfect but Kay thought it might be too big, so we got both. It was only a few dollars worth of hardware. Today, we set about mounting this stuff. Opened the trunk. Assembled the hardware. Removed the plugs from the holes. And just a few minutes later, we had solidly mounted attachment points. Hey, presto! It was shockingly easy. We didn’t quite trust it. We ran the leashes under the seat back and into the trunk, and attached them to the eye bolt. Then we decided we should probably shorten the leashes a tad, so we did a sorta twisty thing that took up a few inches and now the length is just about perfect. 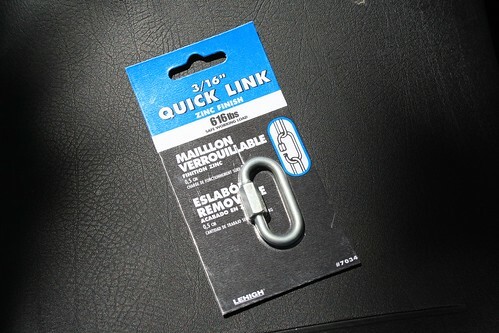 The quick link attaches to the eye bolt and screws shut, making it secure. 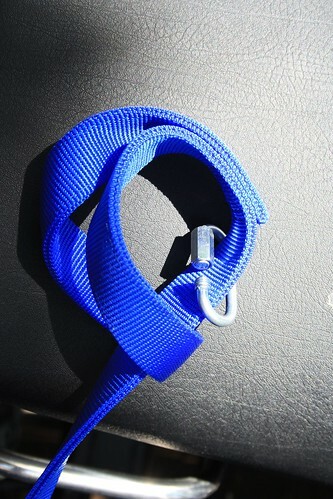 We clip the leash to one of the side D-rings on the dog’s harness (one leash and mount for each dog) and the dogs are secured in the bike! 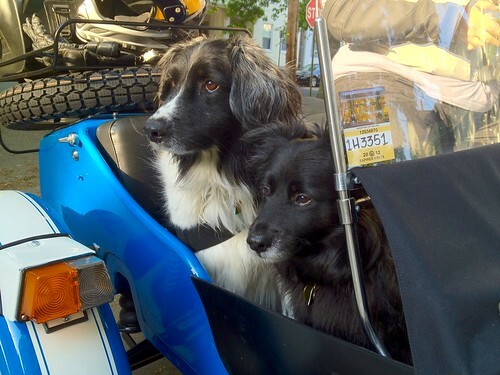 We may adjust the play as we ride, but right now it seems just about perfect – the dogs have enough slack to be able to change positions in the sidecar and move around each other, but they’re not completely loose. These are four foot leashes, and as you can see from the picture we had to put a loop at the end to take off a few inches. May tighten it a smidge, but may not. 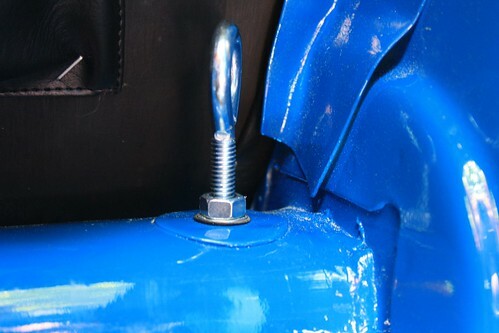 The second part of our dog restraint system is… a door for the Ural. We bought this door off eBay before we even had a Ural. It has sat in our living room for months. It was a symbol of the Ural we were going to get, and using it for the dogs. Unfortunately, it doesn’t quite fit perfectly in the Ural as it currently stands. We futzed around with one of the mounting tabs for a while before deciding to cut it off completely. We’ve kinda hacked on a system to hold it in place, but I’m not satisfied with it – I’m concerned that if the dogs lean against the door, it could move or even pop off. So we need to work on that. Here’s us installing the door (you can see the dogs in their harnesses and one of the leashes attaching to a harness). And this pic kinda shows the door. Yes, the door is a different color. We’ve pondered painting it blue to match the sidecar, but we may also just sticker it or stencil “Corporate Runaways” on it so people know who we are when we’re out driving around with it. 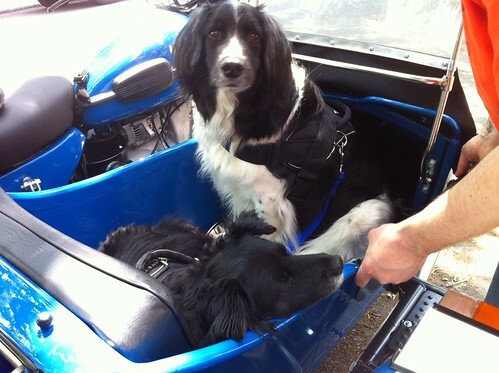 It gives the dogs a nice visual boundary – they’ll learn that when the door is on, they’re to stay inside the sidecar – and gives me a bit of peace of mind about them leaning too far out the side of the sidecar/falling out. Is this the right solution for everyone? I’m sure it isn’t. Everyone has their own ideas of what’s secure and what they want to do. Some people prefer breakaway attachments, while others want something more solid. Some people mount multiple attachment points, or make them quite short to prevent the dogs from slamming into the windscreen in collision. We want the dogs to have the ability to move around, as we intend to do very lengthy rides with them. So we’re not totally sure what the final length of our attachment point is going to be. One thing is certain: with the custom Pooch Pad we’ve gotten from Riddle’s Custom Upholstery via Soviet Steeds, and our dog harness attachment system, we – and the dogs – are much more comfortable with them riding in the sidecar. Now the real question is: how will they take to long trips in it?